It was inevitable, no? The minute Walt Disney paid a large fortune for the rights to George Lucas’ Star Wars empire, jaded critics and rabid fans feared the "Disneyfication" of their bold, sci-fi world. 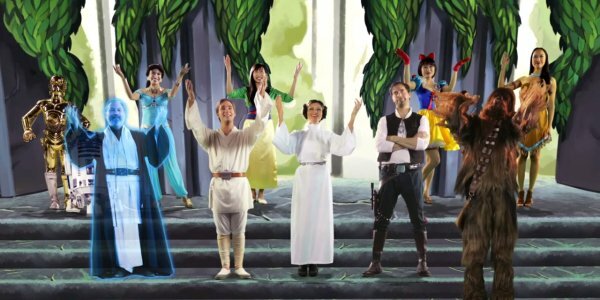 Well, the fan-made Star Wars: The Musical is all of those fears brought to musical-theater life. Watch the above clip and try to laugh along. It’s a joke, people! Treat is as such and keep calm. Because how else are we supposed to respond to Luke Skywalker and Obi-Wan Kenobi spooning like they are on the bow of the Titanic, singing "A Jedi World" (modeled after "A Whole New World" from Aladdin) while Disney product placement crams every inch of the screen? Or the band members in the Mos Eisley Cantina playing a version of "Under the Sea" from The Little Mermaid, so Han Solo can croon a show tune while drinking with Pocahontas and Snow White. Seriously, this fan-made short film is like the hyperdrive version of Disney pop-culture overload. And they promise future episodes for Empire Strikes Back and Return of the Jedi. What, no prequel trilogy? Cowards.